Online Teacher Academy Courses Starting Soon! Our Online Teacher Academy offers a variety of online Learning Modules including: Common Core Sate Standards, Course Design, Effective Classroom Practice, Assessment, Feedback on Teaching, Documenting Teacher Effectiveness, Mentoring & Advising to teachers every quarter for to build teaching capacity and online educator effectiveness. 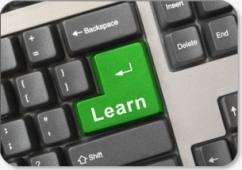 Training modules are nine weeks in length and delivered through a web based Learning Management System. Learning is asynchronous meaning the learner can sigh up and complete the course work any time during the span of the quarter for completion. A certificate of success is awarded upon completion with hours successfully completed. Each module lasts nine weeks and costs $199. Sign up for Winter, Spring, Summer, or Fall Modules. We are now enrolling for WINTER 2014! Edmodo is an up and coming Web-Based Learning Management network for teachers and students. Edmodo is intended to help K-12 schools and districts create closed, private, online communities for teachers, students, and parents for the purpose of facilitating communication and collaboration. Teachers can use it to post messages, discuss classroom topics, assign and grade work, share content and materials with students, and collaborate and share content with other teachers; students can use it to access projects, assignments, and quizzes; and administrators can use it to track school and classroom engagement, view grades, and schedule events. This nine week module will introduce the user to Edmodo and demonstrate how to set up your own groups and classrooms. Module begins on January 12th and will be nine weeks in length. Because all US DIGITAL LITERACY modules for the Online Teacher Academy are asynchronous you can determine your own pace during the course of the nine week period. Module begins on January 12th and will be nine weeks in length. Because all US DIGITAL LITERACY modules for the Online Teacher Academy are asynchronous you can determine your own pace during the course of the nine week period. The Common Core State Standards Initiative is a state-led effort that established a single set of clear educational standards for kindergarten through 12th grade in English language arts and mathematics that states voluntarily adopt. The standards are designed to ensure that students graduating from high school are prepared to enter credit bearing entry courses in two or four year college programs or enter the workforce. The standards are clear and concise to ensure that parents, teachers, and students have a clear understanding of the expectations in reading, writing, speaking and listening, language and mathematics in school. This course will give you digital tools to help you access technology while navigating Common Core. It will also help you unpack standards in a protocol for in depth lesson planning. Module begins on January 12th and will be nine weeks in length. Because all US DIGITAL LITERACY modules for the Online Teacher Academy are asynchronous you can determine your own pace during the course of the nine week period. It’s simple. Click on the module below that you want to sign up for. Submit your payment via PayPal and verify you made your payment through our contact us page! When you complete the course verification and payment form you will receive instructions form us when it is time for your module to begin. We look forward to seeing you online!